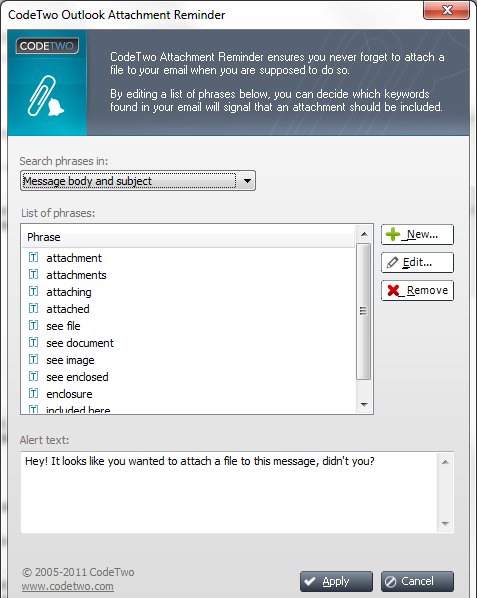 CodeTwo Outlook Attachment Reminder is a free add-on that can be useful for every user of Microsoft Outlook. The program scans a content of your e-mail and if it finds expressions, such as e.g. `enclosed` or `attachment`, it recognizes the message as the one that should include a file. The application alerts you when you are about to send such message without appropriate files attached. Owing to this, you can avoid stressful situations.